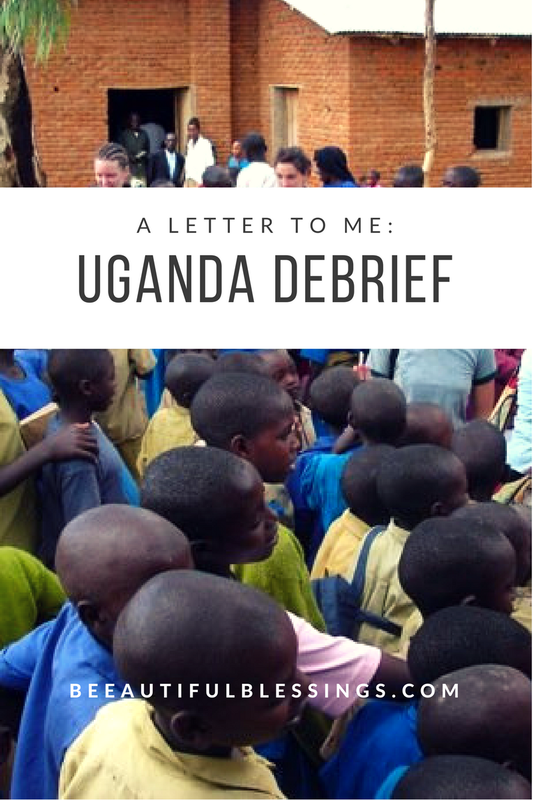 On May 3rd, 2009, 4 days before I departed Uganda, while participating in a day of fasting and silence, I wrote a letter to myself, which I just now received. In that moment of immense clarity, I perfectly summed up everything that Uganda was for me. So for those of you who've asked me to describe my experience, I apologize for my complete inability to put together my thoughts and emotions and let you in. But I'm hoping, finally, by reading this you'll be able to see just how profound my time there was, and how I've changed since then. Right now I'm participating in USP's Debrief Solitude & Fasting and trying to reflect back on my semester in Uganda. Ha- remember way back then?? I'll admit- my feelings now can pretty much be summed up in one word: fearful. I'm afraid. Afraid to leave Uganda. Afraid to leave the friends I've made here. But mostly just afraid to return home where I'm likely to fall into old habits and be surrounded by people who want to hear all about my time here, but will never truly understand what I've experienced and how it's changed me. I'm altogether dreading it to be honest. I feel as though I've experienced a lot of changes in my beliefs and behaviors that I hope to remember and stick to. For starters, running daily has brought me immense joy. It's given me time to let go of all my stress, to stop thinking and just spend time with God in the beauty of His creation. I don't know how I would've managed this semester without it and I really want to continue it when I get home. Something I spent a lot of time thinking about in Faith & Action and ATR were the ideas of how accepting we in the West are of our own sins of greed and materialism, but how quick we are to judge the unfamiliar sins of polygamy or what-have-you. It's added another dimension to my beliefs about homosexuality and the fact that it is no worse than any other sin. It's only reinforced my belief that the ay community deserves the same rights as everyone else. Ironic that I made this discovery within a country that sentences homosexuals to life in prison simply because they're gay. I also fell in love with the idea of religious pluralism. I've spent an awfully long time struggling with the idea that my religion is the "right" religion and if my God is a just and loving God, why would He choose me to save while leaving many of His children who've never even been exposed to Christ, to burn in hell?? To put terminology to the idea that there is truth in all religions and Christ can be found outside Christianity has provided me with immeasurable comfort and reassurance. More than that, however, it's renewed my faith in God's love, grace and justice. On a smaller note, I cannot forget my time spent in Creative Writing. It completely revived my love for writing and literature, as well as providing an opportunity to receive some much-needed therapy to get out a lot of the angst I had about Ed, Josh, Daddy and Frankie. I'll never forger the one-on-one time spent with Jason. He asked me if I considered myself a happy person. I told him, I'd like to think I am, but for the most part I think I tend to be more negative and pessimistic. He disagreed, telling me that he does think I'm a happy person and that I need to use those past struggles to relate to those who've been through what I've been through and to help those who haven't to understand. This, along with the struggle I'd been having in how depressed and negative I'd become and how to get back to the happy Kaity I used to be, eventually led me to the realization that to remain negative and pessimistic is to completely discredit the amazing blessings and works God is actively doing in my life. We devoted so much time to experiencing and talking about simple living throughout the semester, it'd be impossible to leave without it having some kind of impact on me. It's really made me aware of how much I DO have and how frivolous I am with it all. I really hope to become much more conscious about how I'm spending my money, but more than that, I want to abandon the diea that because I "earned" it, that it rightfully belongs to me. I now know that if I'd been born into a family in Mukono or Serere, there's no way I'd be able to have all the wealth and opportunity I have now. With that in mind, I need to give credit where it's due and acknowledge that all I have is property of God alone, and I need to treat is as such. The possible highlight of the semester (apart from Debrief, because so far, it's been incredible) was Rwanda. I may have learned more about the world, God, and myself in that one week than I learned in the entire semester. For starters, just seeing the difference between Rwanda and Uganda made me realize there's sooo much in the world I still need to see and experience. It certainly won't help my restless spirit, but I know the extent of what the world has to offer and I'm prepare to seize it. I also obviously have to address what we witnessed concerning the genocide. I honestly am still having trouble trying to fathom the brutality of it all. I just couldn't understand how much you would have to dehumanize a person or group of people in order to commit such unthinkable crimes. I'd spend a large majority of my time in Uganda feeling utterly depressed with the abundance of corruption in African governments and with no hope in sight, seriously contemplated a future in the military as an easy solution to a deep-rooted problem. Seeing what I saw in Rwanda served to make me realize and drive the point home that 1)there is no just war. The way the Hutus dehumanized the Tutsis is exactly what the U.S. is doing to people in the Middle East and 2)it is a lot easier to hate someone than it is to love them, but it is, after all, what Jesus calls us to do to bring His kingdom to earth. What we saw in Rwanda absolutely broke our hearts. But as I gave my testimony to that rural Church, I summarized the entire theme of the trip. Although everyone needs to remember what happened in April of 1994 and keep those who were lost in our memories, Rwanda should not (and hopefully, will not) be defined by the genocide. Rather, the faith, perseverence and hope we witnessed there will serve as how Rwanda will be defined for years to come. I recited for the Rwandan congregation my favorite verse" Isaiah 40:31, and I still hold it to be true. Especially in light of the genocide survivors AND killers. The whole experience inspired my tattoo idea, which I will hopefully have the next time I read this! On a more personal note, meeting some of the survivors who've completely forgiven the killers who massacred their families and ruined their lives has made me see how petty my grudges are and how much I need to actually forgive Ed. I've experienced nothing compared to some of those people, so who am I to refuse forgiveness?? I guess this is long enough, so I'll end here. Good luck over the summer and in your senior year! But mostly, don't ever forget what you learned in Uganda. Hey Kaity! It sounds like your trip was an incredible experience. Its great to see that you've learned so much about your self and God through this experience! Don't lose your passion!